This week’s cartoon will be understood best by folks who sing. To reproduce my copyrighted cartoon in any way, first request permission by contacting me through my Contact page, and explain the particulars of where you are considering publishing it. 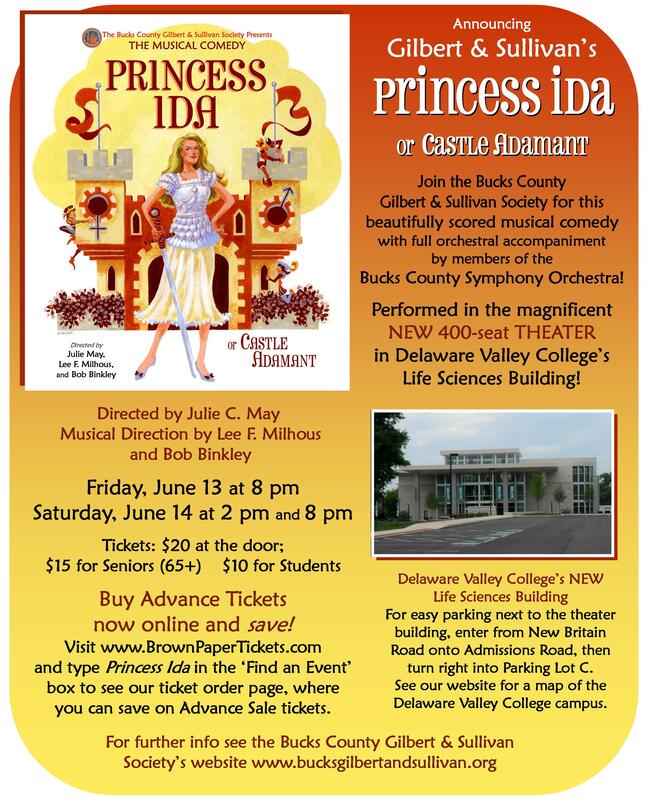 It was prompted by my attending a rehearsal for the show whose poster art took up my last few posts – ‘Princess Ida.’ The music at last night’s rehearsal, accompanied by members of the Bucks County Symphony Orchestra, was stunning. Not just because of the tenors, mind you, although there were a few outstanding young fellas of that part, but the lyricism and lushness of Gilbert & Sullivan’s profusion of song in this production. And not even just the vocal parts – the intros and counterpoints that the orchestra plays, almost incidentals, are over-the-top gorgeous. I highly recommend the show, which runs only one weekend, June 13 and 14. Most of the info is in the ad below, the rest is at the website of the Bucks County Gilbert & Sullivan Society. This entry was posted in cartoon, News, theater and tagged bucks county gilbert & sullivan Society, cartoon, heaven cartoon, pat achilles, princess ida, tenor cartoon by patachilles. Bookmark the permalink. Not to mention it’s perfect for the Sunday E-Blast!! Thanks, Bruce! I’ll be happy to see it! I prepare the monthly newsletter for the Dauphin Island United Methodist Church in Dauphin Island, Alabama, and we are trying to encourage new choir members to join. I would like your permission to use this cartoon as my introduction to my choir article for my October newsletter, which will go out on September 29. I hope you will let me share it with my 350 readers. They will love it! 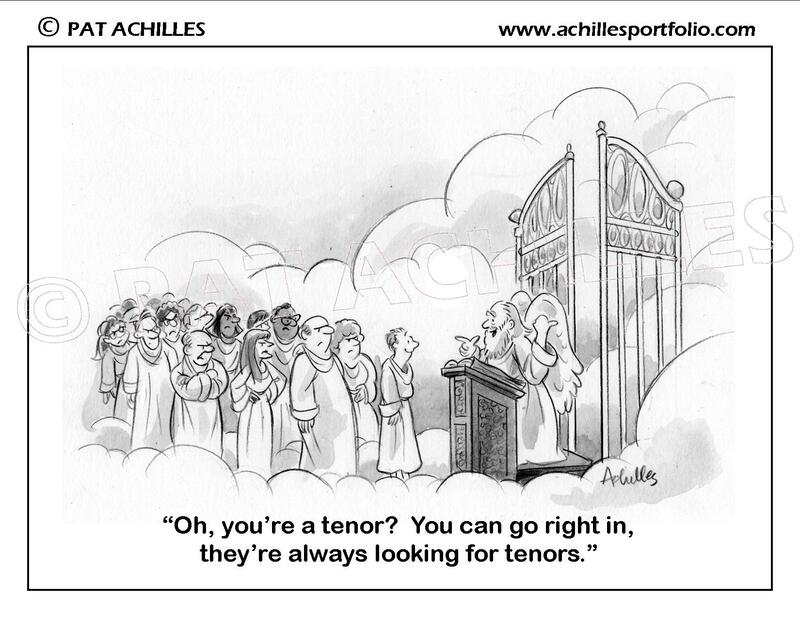 Being a tenor, I can tell you from experience – we are always in demand. There have been fewer tenor voices than any other in every choir I have ever sung in. In some cases, 1/2 the number of basses, for example. It puts a smile on my face, just thinking about it. Question: How many tenors does it take to screw in a light bulb? … None, When you’re a tenor, you don’t need a light bulb.